As part of a quick 5-night trip to Australia, I booked my first international premium cabin flights. The ticket was from my local airport (ACV) to Sydney, Australia (SYD), and included a flight in United Polaris First from SFO to ICN (Seoul Incheon). 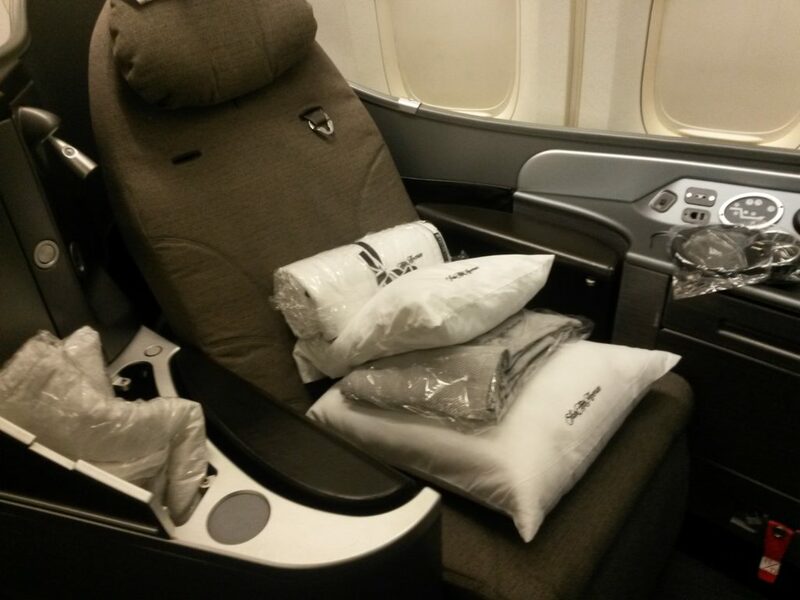 The final leg from ICN to SYD was in Asiana business class on one of their A380s. The ticket cost me 80,000 United miles and $37 in taxes and fees. Although it would take me longer to reach Sydney with the layover in Seoul, this gave me the opportunity to fly two different long-haul premium cabins. When I was booking the flight, I completely intended to select Business First (now Polaris Business) on the upper deck of the 747, but Global First (as it was called when I booked) was priced the same. When I saw that seat 1A was open, I changed my plan and jumped on that. I arrived at SFO via a short connecting flight from Arcata-Eureka. Things were mostly uneventful, except for a full pat down by the TSA after my bag failed the explosive sensor test. While at San Francisco International, I spent my time in the United Club and the Global First Lounge in International Terminal G.
The Global First Lounge SFO was great. Best United Lounge I’ve visited. A review on that is in the works. My guess is that this Global First lounge will be rebranded as the SFO Polaris Lounge, but I haven’t heard anything regarding that change. I made my way from the lounge to Gate 93 just before the scheduled boarding time. While I arrived 2 minutes early, boarding had already commenced for passengers in Polaris First. It was weird to literally walk straight from the lounge onto the plane. As I already mentioned, I was in seat 1A, right in the nose of the plane. The seat was just what I had expected. I read reviews and browsed pictures of United’s Global First hard product, and as underwhelming as some made it sound, I thought it was great. But you may want to take that with a grain of salt, considering it is the first real international premium product I’ve ever flown. There were pillows and blankets waiting for me, which I stored in the deep compartment on the aisle side of my seat. I pulled out the few things I needed from my pack and then settled into my seat. In no time at all I was stretched out and ready for take off. Soon the attendant came by and offered me a pre-departure beverage. I opted for ginger ale, which is a fairly standard choice when I’m flying. In addition to the refreshment were chocolates. Having just eaten a large breakfast at the lounge, I left them untouched. The menu was nicely presented and was distinctly marked for first class. The booklet also contained some hype about the introduction of Polaris. The server asked us to choose an entree and an arrival meal. I opted for the seared turbot for the former and and the seasonal fruit for the latter. I glanced over the wine menu. Honestly, I have no idea if any of United’s selection are good, bad, or run of the mill. We pulled back from the gate right on schedule, and I snapped a few shots while we were taxiing. If you want to do some 747 spotting, SFO is the place to be. All of United’s remaining 747-400s are based there now. While waiting to take off, we were able to watch a Japan Airlines 777 touch down. Takeoff was amazing. Takeoff is already my favorite part of flying, but it is a dozen times better from the nose of a 747. The g-forces feel weird in the nose seat since you are slightly angled to one side. As San Francisco disappeared beneath us, I immediately noticed the difference in noise from what I was used to. Normally the engines are the main background noise source, but I hardly noticed them from the nose of the plane. Instead, the noise of both the air system and the air rushing around the plane dominated the background. Soon after takeoff I plugged my phone into the USB port by the window. The panel also includes the seat controls and the in-flight entertainment remote. 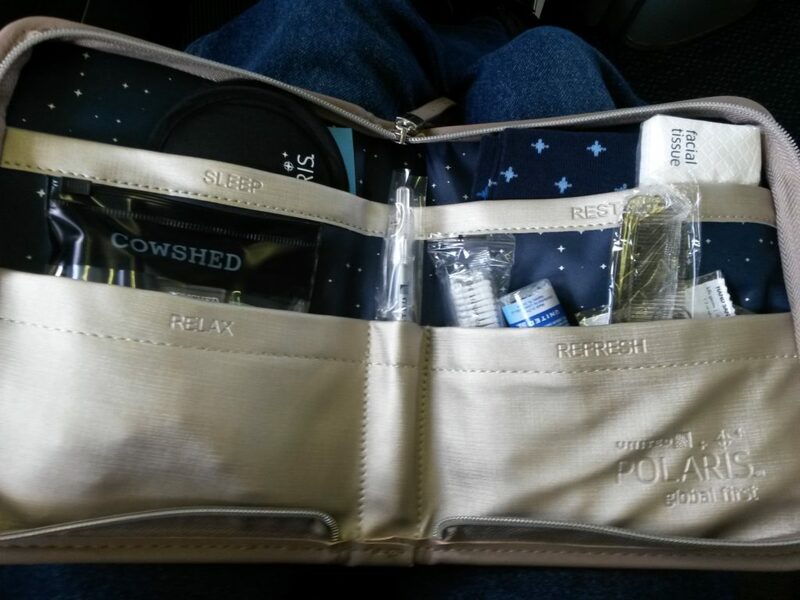 Soon the flight attendant brought us our amenity kits. Meal service started fairly quickly after we were airborne. The server brought an starter of nuts and skewer of an olive, basil, dried tomato, and fresh mozzarella. I did order a glass of white wine. This is very atypical, since I essentially never drink alcohol of any sort. I just figured I’d try it. As suspected, I wasn’t keen on it. I managed to make it through half the glass over the course of the whole meal service. The server finally relieved me of it after dessert. The appetizer was some fairly good cold tuna and a quinoa salad. The salad was hands-down the best part of the meal service, which I guess tips you off that the entree was underwhelming. I understand that this is food that has to be packaged and prepared for an airplane, but….I think United could have done better. The fish and risotto were pretty terrible. Luckily, dessert was delicious. There was a selection of a few different dessert cups, mini apple pies, and a sundae. I had both a tiramisu dessert cup and a sundae (and one of each of the other dessert cups later in the flight). All very good. I feel like the whole service took roughly 90 minutes. Maybe I am exaggerating, but it felt long to me, as I tend to eat rather way too quickly. There were decent gaps of time between courses. After the meal service I took a peek out the window. For most of the flight I only had a sea of white to look at. About 3 1/2 hours in, the flight got exciting. I felt the plane make a fairly hard bank to the right, turning north, and immediately wondered what was up. Seconds later the captain informed us that we were diverting to Anchorage! One of the passengers on board was going into labor and we had to get on the ground as quickly as possible! I previously detailed my crazy experience during the whole incident. From the moment the captain made the announcement, it took us just about an hour to get to Anchorage. The diversion did give us some great views of Alaska. I had never been to Alaska (and still don’t technically count this as “visiting” Alaska since I don’t count transiting airports as visiting a state/country). We were on the ground for about 2 hours, if my memory serves me well. The first few minutes were exciting as paramedics boarded the aircraft to transport the woman to the hospital. During our time in Anchorage, we were able to watch a Dreamlifter take off. I had never seen one of the massive cargo planes! Debbie, our wonderful first-class flight attendant, took us on a little tour of the upper deck while we waited. This was a highlight for me. Two of the other first class passengers (who had just gotten engaged) took pics in the cockpit. I walked as much as I could while we were on the ground. The whole incident actually broke the ice for everyone in first-class as we laughed and joked together. 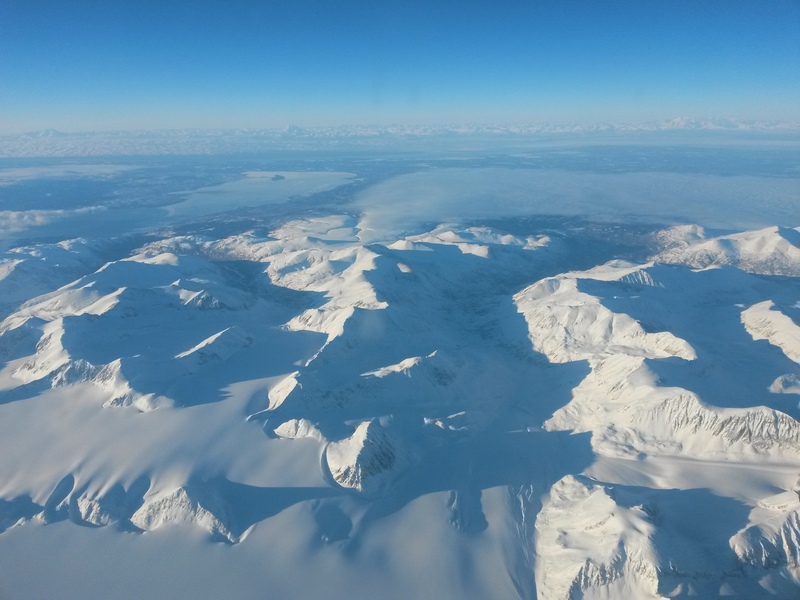 We took off again from Anchorage at about 4 p.m. local time. The captain said we should be arriving at Incheon at roughly 6:45, which I hoped would give me enough time to make my Asiana connection. Soon after we were in the air again I asked the flight attendant for pajamas. She kindly made up my seat into a bed while I changed in the lavatory. Part of the bedding includes a pad on top of the seat. It was comfortable at first, but I found that I started to overheat after a while. The pad seemed to contribute to that problem. I was able to sleep for about an hour and doze for maybe an hour more. I then used the controls to tilt the seat up just a little and settled in to watch the recent remake of Ben-Hur. Debbie literally came to check on me every 30-60 minutes, and I finally let her make me a beef and rice bowl about halfway through the movie. It was honestly better than the main course of the meal service, and I wish I would have ordered it earlier. After the movie was over, I worked and wrote for a while on my laptop. As we neared Seoul, I opened the windows to catch a glimpse of a snow-covered Japan. The final meal service was the light breakfast, served about 90 minutes before landing. The fruit wasn’t especially good, and I could tell it wasn’t very fresh. I didn’t touch the cereal. Overall, I found myself mostly underwhelmed by United’s meal service. For landing I stowed my bag in the crew closet (with their permission) between seats 1A and 1K as I found it was too fat to compress back into the overhead bin. I had added my laptop and a few other items that were previously in the storage compartments at my seat. The landing at ICN was smooth, and even though I enjoyed myself immensely, I was glad that the flight was finally over. The next 45 minutes were spent hurrying to the gate for my Asiana flight, which I did successfully make. Overall, I liked my experience flying United Polaris First SFO to ICN. The meal service was underwhelming (especially in comparison to the catering I had on the Asiana flight immediately following my time in United Polaris First SFO to ICN). The seat was comfortable, though, and the service excellent. The flight attendants really made my trip, especially Debbie. I tweeted United regarding the diversion incident, telling them what an excellent job she did in the first-class cabin. If you want to fly the United Polaris First product, you better do so soon! It will be going away entirely with the retirement of United’s 747-400s by the end of 2017. 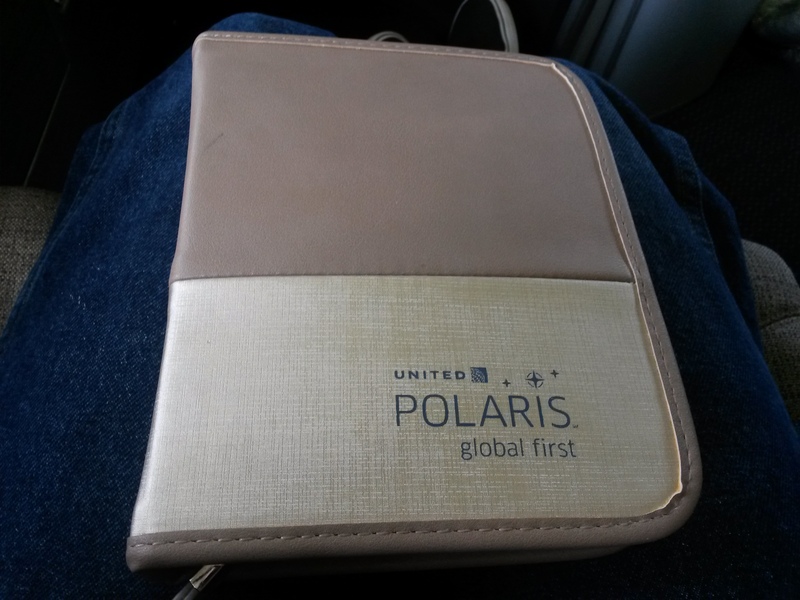 United will only be offering the Polaris Business class product moving forward. The days of Polaris First are numbered. I would like to diverto to Anchorage, but only with happy endings like what happened in your flight. Well, I had a blast reading your FR! Keep ’em coming! The ANC diversion is definitely an exciting event. A couple years back I was on one of the new DEN-NRT non-stops on a 787, and we had to do an emergency landing in ANC because it was the closest airport, due to some flap issues. Unfortunately, we had to be offloaded and had to spend the night at a hotel, which wasn’t fun. United really managed the whole thing horribly. There were a few GS “passengers” who called the GS desk to make alternate arrangements, but was told, “no, the flight is on-time”! Amusing thing was while the pandemonium was going on in the airport, I saw the captain stroll out of the airport, calm as a whistle, like nothing happened. Bummer on the overnight. I would have been rather upset had that happened to us, as I would have missed my connection and been set back a day on my already brief trip to Australia. I was quite worried the captain and crew were going to time out for the day and we would have to be grounded. Glad that didn’t happen. Meanwhile, on the 9-hour non-stop from IAH to HNL, United flies 777s and 767s where the next flight has to be to the Arizona jet boneyard. The seats are awful, they supposed hydraulic foot rests don’t work, and I had to yank my seat back manually to get it upright for landing. “First class” on THAT flight is nowhere near what you described. I guess domestic passengers using a reward for “first class” have been downgraded, even though the prices in miles or $ are 2-4 times higher than coach. 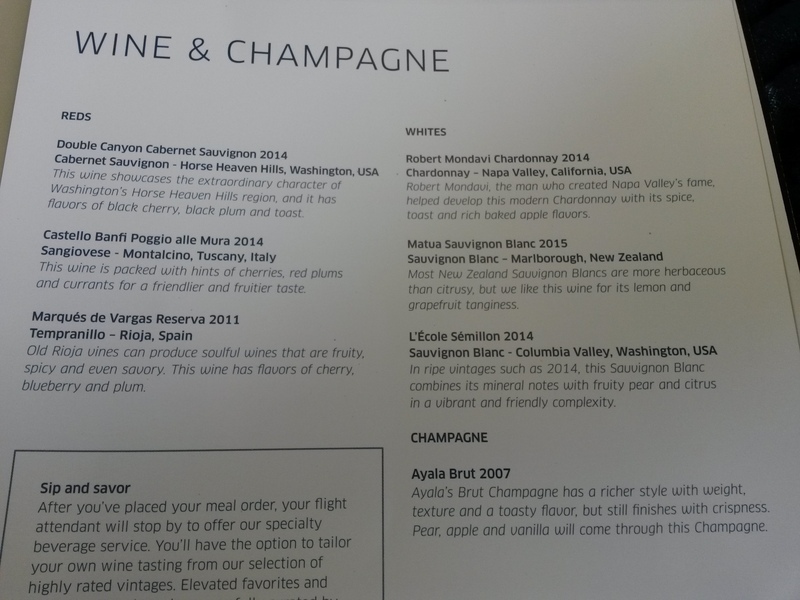 Free access to the United lounge in IAH for “first class” domestic passengers? Nope. United took that away as well. The only thing that came close to first class was the meal.